On Sunday, August 5th, as we all continue to watch and pay tribute to the spectacular Olympics, we have the opportunity to celebrate another worldly event: International Beer Day. Let us all join together on this special occasion by sampling beers from around the planet. Show your competitive spirit by playing Beer Chess, Beer Pong, or perhaps the less complicated Beergammon. 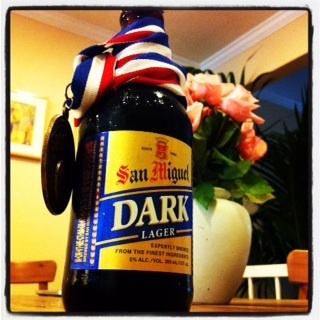 Prepare medals for the best tasting beers and display them for eternity in your man-cave. Sip your beer with passion, determination, and hard work, because as any Olympic athlete will tell you, that's what it takes to get really, really good at something. My trustworthy BevMo Beer Expert directed me to a few beers that I'd like to try: Bear Republic Racer Five IPA, Shipyard Monkey Fist IPA, Firestone Rsv Wookey Jack IPA, Lagunitas IPA, and Green Flash West Coast IPA. Surely these selections will see me through hours of badminton, beach volleyball, and boxing finals. Somebody has to take this world-wide celebration seriously, and I only hope I'm not alone.